Garth Ennis and Raulo Caceres bring you a black humor horror book unlike anything youve read! Pru wanted nothing more than to join the FDNY and help people as a paramedic. However, that was not to be, as she gets assigned to a special unit that tends to the monsters that live in modern day New York. Vampires, zombies, ghouls and all the creepy things that live around us in he shadows. But no one told her that was her assignment. Learning on-the-job is much more challenging with the supernatural! 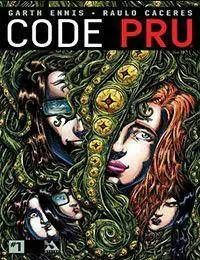 This series is a lead-in to the ongoing monthly Code Pru stories running in an anthology to be announced shortly! Raulo Caceres art never looked better than in the luscious black and white of this series.